WASHINGTON -- President Moon Jae-in's security adviser said Wednesday that a declaration to end the 1950-53 Korean War would have nothing to do with the South Korea-US alliance or the presence of American troops here. Moon Chung-in, a special advisor for unification, diplomacy and national security affairs for President Moon Jae-in, made the remark in a meeting with Yonhap News Agency in Washington, apparently seeking to dispel concerns that an end-of-war declaration would eventually lead to a pullout of US troops from South Korea and a crack in the Seoul-Washington alliance. The adviser proposed that North Korea and the United States take simultaneous measures in order to remove the ongoing deadlock in bilateral dialogue. Specifically, he said that the North should suspend its production of nuclear materials and give a full declaration of its nuclear program, while the US should consent to the declaration of the end of the war. North Korea has persistently demanded that Washington agree to declare an end to the Korean War ahead of the denuclearization of the Korean Peninsula, while the US has prioritized the presentation of a denuclearization list by Pyongyang. The conflict has recently led to the postponement of US Secretary of State Mike Pompeo's planned trip to Pyongyang. 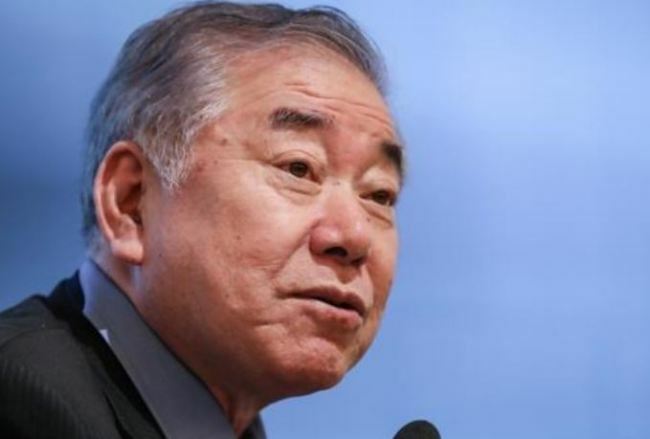 Moon, who was visiting Washington to attend a seminar on the South Korea-US alliance, stressed four major factors for a declaration of the war's end. "First, it'll be a symbolic end to the 65-year-long ceasefire signed in 1953. Second, it's aimed at ending hostilities between the Koreas and between the North and the US Third, the armistice will be maintained until a peace treaty is signed," the adviser said. Lastly, he said, an end-of-war declaration is intended to link denuclearization to a peace regime.